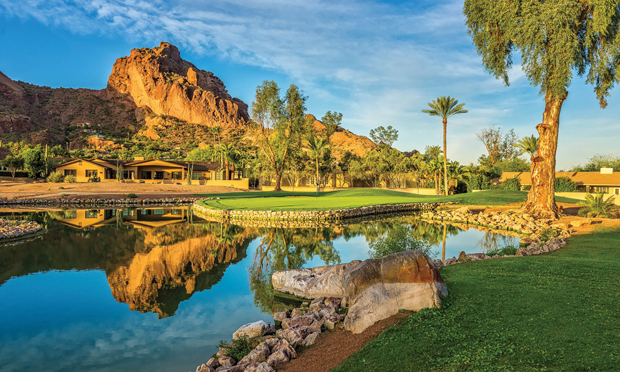 Three short takes on short courses that are changing the Arizona golf landscape by Colorado AvidGolfer Editor, Jon Rizzi. Short takes on three short courses changing the Arizona golf landscape. So, you think par-3 courses lack challenge? Any Coloradan who’s played Tom Doak’s 12-hole Mulligan Course at Ballyneal Golf and Hunt Club or Dave Pelz’s Short Course at The Club Cordillera will scoff at your naiveté. So will anyone who has taken on the Bad Little Nine at Scottsdale National Golf Club—a par-3 configuration so diabolical, club owner Bob Parsons will pay $1,000 to any player who breaks par. Think playing nine holes isn’t worth your time? Ask the guy who squeezes in nine before work at City Park Nine, at Family Sports during lunchtime or at Hyland Hills at twilight. He will no doubt take issue—and your money the next time you play, since you “don’t have the time” to work on your game. And if you think you need to spend five hours a day on your Arizona vacation spanking around that little white ball, three new, very different courses—The Short Course at Mountain Shadows, Li’l Wick and the forthcoming Seven at Desert Mountain—will give you a golf fix while leaving plenty of time for life’s other pleasures. Each is quick, and challenging, and cultivates an oft-overlooked ingredient in golf: fun. Snyder’s course opened in 1961. Its star rose with the resort’s before declining in popularity as course development exploded in the Phoenix/Scottsdale area. Snyder died in 2005, the year after the resort (and his course) at the base of Camelback Mountain closed and a decade before its demolition and brilliant rebirth under the aegis of Scottsdale’s Westroc Hospitality. Clearly, what the game needed then, it still needs now, and who better to meet that need than Snyder’s right-hand man for 25 years, Forrest Richardson? How right he is. The holes on Richardson’s layout—which opened last year and measures between 1,735 and 2,310 yards—range from 75 to 193 yards, and feature no shortage of challenge. Mounds, bunkers, slopes and ponds guard the ample greens, which vary in size, shape (the fourth is a Biarritz, the 10th a punchbowl) and contour (the 13th and 14th are descriptively named Dells and Mummy). They are both fiddly and eminently fair, producing numerous fun putts. The sly addition of “Forrest’s Wager”—a rollicking par-2 putting hole after hole 17—makes the longish journey to the 18th tee somewhat shorter. You can walk or ride the entire course in two hours and never feel like you saw the same hole twice (though you might do a double-take if occasional visitor Paige Spiranac stops by). The sleek, modern clubhouse boasts large framed reproductions of vintage ads for Wilson golf balls, Jaymar Sansabelt slacks and McGregor Cupioni Rayon shirts—all popular items during the resort’s first iteration. Fun photographs of original owner Martin Stern, Jr. with celebrities also hang in spots throughout the hotel, but the resort is anything but a throwback. Private cabanas surround the two outdoor pools. Modern amenities and swish furnishings appoint the rooms, and the open kitchen at the popular Hearth ’61 (named for the year of Paradise Valley’s incorporation) turns out an impeccable rack of lamb, tomahawk rib-eye and sublime salads and sides. The course welcomes the public to share in the fun, especially this December 19, when it resurrects the Mountain Shadows Golf Open. At $500 per player (food included) for the event and $169 a night, you could find yourself going “short” for a long time. About a 45-minute drive northwest of Phoenix, Wickenburg Ranch calls itself a Golf & Social Club—an apt description of the two forces that mingle organically at Li’l Wick, the nine-hole, par-3 sidekick to the property’s award-winning par-71 18-hole course known now as Big Wick. Bill Brownlee and Wendell Pickett of Phoenix-based M3 Companies designed both courses. While the big one’s an absolute must-play, the little one’s a can’t-miss. The course pivots around the lakeside Watering Hole, a sports bar where golfers check in by writing their name on a chalkboard. No tee times, no dress codes, no pace of play enforcement. Just wait your turn. For $25—$15 if played in conjunction with the “regulation” course—you get to play nine holes from one of three sets of tees: Revolver, Bullet and Spur. The longest hole measures 187 yards; the shortest, 62. It’s a mini Big Wick, with ample fairways and ampler greens making for a fun experience. Lakes factor into a couple of holes, but not if you’re playing from the forward Spur tees, from which even a non-golfer could play the whole course with a putter. Music streams from speakers on every hole, while drinks flow from the Watering Hole, located just a short walk along a wooden footpath from just about every tee and green. A giant hammock and numerous cozy seating areas reinforce the chill social vibe, and when it gets late, you can head to holes six through nine or the putting area for illuminated night golf. 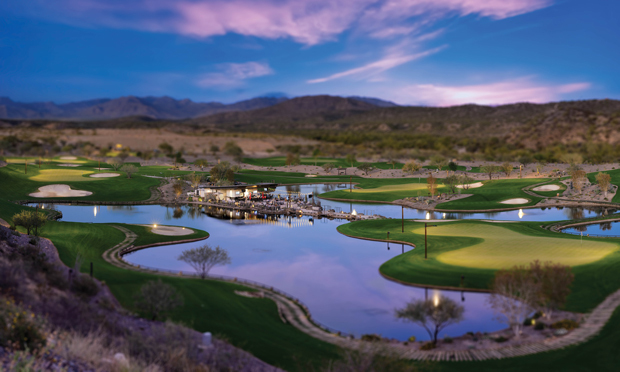 The same team that designed Wickenburg Ranch’s Li’l Wick—Bill Brownlee and Wendell Pickett of Phoenix-based M3 Companies—is putting the finishing touches on a similar project at the Desert Mountain, the 8,000-acre development on the northern tip of Scottsdale. 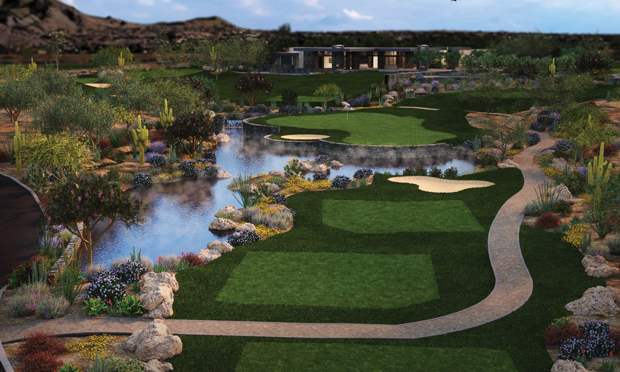 “Seven”—an 18-hole par-54 course so named because it will join the exclusive enclave’s six private Jack Nicklaus-designed layouts—will occupy a 90-acre parcel just west of the existing entrance on North Cave Creek Road. Seven will have its own entrance, one “that brings you into an enclosed space and focuses on the elegance of the community,” Brownlee says. A total of 190 custom, semi-custom and condominium homes ranging from 2,200 to 6,500 square feet will eventually border the course. The activity, however, will center around Seven’s Drewett Works-designed clubhouse. Perched on a hill with dramatic views of both the mountains and valley, this fun and family-friendly community gathering place will feature an indoor-outdoor gastro pub, large patios for dining and entertainment, welcoming fire pits and bocce courts. The course will have three sets of tees and measure more than 3,000 yards from the tips. 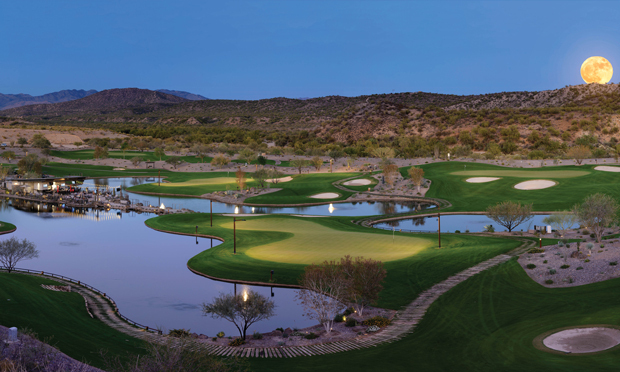 Designed for all skill levels, the course, like all others at Desert Mountain, will feature bentgrass tees, fairways and greens.